In fall 1921 the 2nd International R-rule of 1919 was evaluated by I.Y.R.U. Most members were pleased with the experience with the new rule. New scantlings were agreed as presented by Lloyds. Until then the old scantlings from the R-rule of 1907 had been in force. In 1924 further revision to the scantlings were agreed. An increase in the factors on measuring bow and stern girth was agreed. The increasing knowledge on aerodynamics on sail resulted in the years to follow in taller masts and narrower sail plans. As max height of sail plan was linked to the floating waterline length (2xL.W.L) this resulted in increased L.W.L. on new designs. As L.W.L. 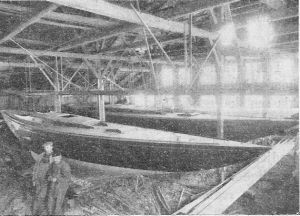 increased, the affect of the in 1921 increased penalty on bow and girth measurement was more narrow and U-shaped bows with wet front decks. Freeboard “F” increased on new designs together with yacht displacement and depth. Max depth was restricted to 16% of L.W.L. + 0.5 meter. The girth factor “G” in formula caused sloping keels less favourable for docking, as on Bjarne Aas design of 1926 “Irene VI” (go to section; R1919 amendments 1921 –1928). As experienced before, the most extreme designs called for restrictions and alterations in the formula to come. This was the situation when I.Y.R.U. met with the Americans in London in February 1927 and agreed upon the restrictions laid down in the 1928 amendment of the 2nd R-rule, put in force from January 1st 1928. The Genoa jib introduced in 1926 was included without penalty in the formula. However, the development of yacht design based upon the Genoa jib where not foreseen by the I.Y.R.U. delegates in the Feb. 1927 meeting. Especially the Genoa jibs impact on the design of masts and rigging. At the same time cost of constructing hollow masts decreased. As spreaders got narrower, more spreaders were required. The number of mast failures during late 1920ties required scantlings to be developed for mast construction, and new materials where looked for. In their meeting in London on December 5th and 6th 1932, I.Y.R.U. agreed upon steel masts and min weight of masts, which for an Eight Metre became 145.1 kg with centre of gravity 37% of max height above deck. The restriction laid down in the 1928 rule amendment on height of sail plan (2xR+1) i.e. 17 meters above deck on an Eight Metre did not limit the height of the jib on mast, and as the height of jib increased on new designs a further restriction was enforced by I.Y.R.U. in their Dec.1932 meeting. Thus limiting max height of jib on mast to ¾ (75%) of max height of sail plan, i.e. 12.75 meters on an Eight Metre. A restriction on the length of Genoa jib aft mast was in Dec.1932 limited to 0.4xR for 10mR and above. In Sept. 1937 this was agreed to 0.5xR for all classes. At the Dec. 1932 meeting restrictions on size of spinnakers were set, max luff measurement not to exceed 0.8 x sqrt(IxI + JxJ) +2.5m with max beam 2xJ. The length of spinnaker pole was in 1919 controlled such as if the length of spinnaker pole was longer than the distance from mast to jib in deck, the length of spinnaker pole should be used as “J” in calculating sail area “S” in the formula. A lot of development and discussions on configuration of masts, booms and spares took place during this period of time. The same took place on yacht outfitting for cruising purposes. The Scandinavian S-rule of 1917 had detailed requirements for number and size of berths, cupboards, and equipment (go to Appendix: S-1917 articles). As the R-rule of 1919 developed over time with common understanding among the I.Y.R.U. members, so did also the rules requirement for cruising and safety facilities. Some facility was included in the amendments and stayed, others were later removed. For instance the I.Y.R.U. meeting in December 1932 agreed that all Eight Metres laid down after January 1st 1933 should be outfitted with WC with pump and pipes. The amendment included a bulkhead to be in place between the cabin and WC. The Americans had since the 1st R-rule of 1907, and establishment of I.Y.R.U., been invited to join. This came about in the period starting with the I.Y.R.U. meeting in London on February 1927, leading up to the 3rd International Rule of 1933. After visiting the Scandinavian countries and KNS spring regatta in Oslo on June 14th and 15th 1919, I.Y.R.U. President Sir William Burton and Secretary Major B. Heckstall-Smith travelled to America. Returning from America, Y.R.A. called for a meeting in London in October 1919 to agree upon what became the 2nd International R-rule. Britain, Belgium and France where in favour of the American Universal Rule becoming new international, however, after a close vote it was decided to base the new international rule on revisions to the modified 1st International R-rule, the S-rule of 1917, as presented by the Scandinavian countries. As the old classes were very much alive in Europe after the War continuity was an important matter (go to R1919 amendments 19 . The Americans were represented at the October 1919 meeting in London. However, as the negotiations developed they did not join I.Y.R.U. The contact between the continents continued. USA filed already in 1920 an application for the Olympics to come to the USA. 12 years later the Olympic Games was held in Los Angeles, California. None American yachts participated in the 1920 and 1924 Olympics. Competition and no of races including sailors from both sides of the Atlantic increased during the mid 1920ties. The most known are the American Cup challenge cup races which commenced in the 1850 ties and culminates around 1930th with the “J” Class yachts, and in many years was raced for in the 12mR Class. In 1921 the British – American races started. The Seawanhaka Cup Trophy originated in 1895, was offered for the purpose of promoting small yacht racing and developing the corinthian spirit among yachtsmen. The Cup’s official name is “The Seawanhaka international Challenge Cup for small yachts”. History writers tell the original challenge was sailed in half-raters, a boat of about 15 feet, with the Seawanhaka boat Ethelwynn sailed by William P. Stephens sporting a marconi main over 20 years ahead of its time. Ethelwynn won the regatta against a challenge from the Minima Yacht Club of England. The Cup was raced for until the 1910’s when it became dormant for some years. In 1922, after sailing a match of the British American Cup at Oyster Bay, Wee John Stephen of the Royal Northern & Clyde Yacht Club of Scotland challenged the Manchester Yacht Club in his 6mR yacht “Coila III”. “Coila III” won the Seawanhaka Cup to Scotland and defended the Cup in 1923 and 1924. With the “Seawanhaka Cup” raced for in the 6mR Class in Scotland, Norway files a challenge for 1924 but Johan Anker with his design 6N14 “Unni” does not succeed in taking the trophy to Norway. In 1925 Clinton H. Crane with his own design 6mR “Lanai” wins the Cup back to America and The Seawanhaka Corinthian Yacht Club. In 1922 the Scandinavian Sailing Federation (SSF) decided to set up a trophy for international competition within the fast growing 6mR class. This as the French declined to move their “One Ton Cup” (established 1899) to the 6mR Class. The Finns who recently had joined SSF offeres to move the Cup established by Nyländska Jaktklubben (NJK) in 1919 to celebrate Finlands new flag, to the 6mR Class. The cup, originally a nation race between the Nordic countries in the 40 sqm Class, was made of gold with brilliants. The first races took place outside Horten in the Oslofjord in 1922. Representative for Norway was Eugen Lunde with 6N9 “Irene V”, designed by Anker. Norway won the Cup in 1922 and 1923. In 1924 Sweden won the Cup, for Norway to take it back in 1925. Within KDY (Royal Danish Yacht Club) sailors were looking for “Team-racing” against the Americans similar to those taken place between Britain and America. SSF filed a challenge to Seawanhaka Corinthian Yacht Club for races to take place in Long Island Sound the summer of 1925. Four 6mR yachts were shipped over. Finland was represented by 6mR “Gunn 2”, Sweden by 6mR “Althea” ex “Satana”, Denmark by 6mR “Nordug” ex “Elisabeth VI” and Norway by Crown Prince Olav’s new 6mR “Oslo” designed by Anker and sailed by Magnus Konow. The American Team won. However, 6mR “Oslo” was only beaten by ¾ point by the winning American 6mR “Lanai”. 6mR “Oslo” did not return to Norway as she was sold in America. In a letter dated Dec. 16th 1925, SSF invites the Americans to come to Scandinavia and the 6mR “Gold Cup”. The respons from Seawanhaka Corinthian Yacht Club in early 1926 is positive with reference to last years racing in America, and wishes for the unification of a common rating Rule to take place. 1926 was the first year with international competitors for “The Gold Cup”. America, France and Holland were represented in addition to Denmark, Sweden and Norway. 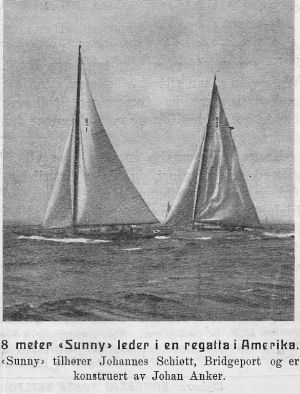 The races took place at Hankö in the Oslofjord and was won by America and the now famous 6mR “Lanai” representing Seawanhaka Corinthian Yacht Club and sailed by Mr. H. F. Whitton. Next competition to take place in New York waters in September of 1927. Great effort is going to be put into winning the Gold Cup back to Europe. In Norway a consortium headed up by Crown Prince Olav is established for the construction of 6mR “Noreg”, design Johan Anker. On their Oct. 16th 1924 meeting in London I.Y.R.U. agreed upon an extension of the 2nd R-rule of 1919. Improved scantlings where agreed upon. The meeting also established a committee to look into a new formula for yachts above 12mR. The intention was to seek agreement with the Americans for the larger yachts. As members of the committee was elected two representatives from Britain, two from the Scandinavian countries (Benzon and Anker) and two from America. The committee was given authority to make agreement on their own. The formula is basic the same Johan Anker suggested to I.Y.R.U. in 1921 as a revision to the 2nd R-rule. Factors “G” and “d” are taken out, and the division factor is reduced from 2.5 to 2.3. Some restrictions vary from the 2nd R-rule. Factor on girth difference at stern were set to 1/3 instead of ½. As girth “G” is not included a restriction on keel shape is set. The keel underside should form a straight line from the aft point to at least a point vertical below 50% of L.W.L. This in order to avoid short keels not found practical on large yachts at the time. Further restrictions were set on mast height from L.W.L. Hollow masts were not permitted on yachts above 14mR and should be made of Oregon pine, as the Canadian spruce was found to costly. Number of classes was reduced. Although New York Yacht Club was very pleased with the Universal Rule for the larger yachts, sailors on the Pacific Coast, in the Gulf and the Great Lakes were not pleased with the development of medium and smaller yachts. The yachts got longer, deeper and narrower with less freeboard and reduced sail area. The hull of the Universal Rule “R” Class was becoming as large as the “Q” Class with less driving force. The only country in addition to America adhering to the Universal Rule was Canada. After winning the Seawanhaka Cup back to Corinthian Yacht Club with his own design 6mR “Lanai”, Clinton Crane is subject to a lot of questions from the American sailing community. He presents his thoughts on comparison of the American Universal Rule and the International Rule in an article in Yachting magazine. A committee is established to evaluate the measurement rules for smaller yachts equal to the Universal Rule Class “P” and below. The committee headed up by Yacht Racing Association of Long Island Sound consists of Mr. William A.W.Stewart, President of Seawanhaka CorinthianYacht Club, and members Clinton H. Crane, Francis H. Early, George H. Gooderham, Philip R. Mallory and Henry L. Maxwell. In fall of 1926 the Committee recommends that the Americans should join the International Rule, 6mR, 8mR and 10mR classes. The committee found that the minimum displacement restriction in the 2nd International R-rule, made the International Rule favourable for the smaller yachts. The recommendation is made subject to obtaining agreement on three restrictions, restriction on min girth measurement at bow, restriction on max height of masts not linked to L.W.L, and allowing centreboards. The new International Rule classes to be introduced in addition to the existing Universal Rule classes. Future would tell which classes would be dominant for the smaller yachts. The International Rule is an “addition formula” and change in the formula can be done by taking out or adding elements with the adjustment of the division factor. President George Nichols of New York Yacht Club (N.Y.Y.C.) did not agree to the criticism of the “Universal Rule”, and as such he opposed any rule change. However, N.Y.Y.C.’s position as the leading part in American Yachting had been reduced with the in 1926 establishment of North America Yacht Racing Union (N.A.Y.R.U.) With only one season to the upcoming 1928 Olympic event in Amsterdam it was agreed to ask I.Y.R.U. for an early meeting to discuss matters. Time was short for the Americans to get familiar with new classes and construct new boats, and a meeting was agreed to take place with I.Y.R.U. in London commencing on February 7th 1927. However, no change in the formula for 12mR and below would take place before the 3rd International Rule in Oct 1933. The I.Y.R.U. committee decision for yachts above 12mR was reversed by I.Y.R.U. in 1929 stating yachts rating 14.5mR and less shall be measured as 12mR and under. In Scandinavia, SSF decided in 1928 upon the formula (L+sqrtS-F)/2.3 for their new 7m Class. The objective of the conference held in London on February 7th-10th 1927 between delegates of I.Y.R.U. (International Yacht Racing Union) and delegates from N.A.Y.R.U. (North America Yacht Racing Union) was as in 1906, 1919 and 1924 to reach a mutual understanding for America to join I.Y.R.U. Delegates from I.Y.R.U. were Sir William Burton in capacity as conference chairman, Sir Charles Mac. Ivor and Capt. R. T. Dixon representing Britain, Alfred Benzon and Johan Anker from Scandinavia, du Pasquier from France, P.L. Lucassen from Holland and count D’Alberts from Italy. The American delegation was headed up by Clifford D. Mallory, with members W.A.W. Stewart and Clinton H. Crane. Several technical advisors were present and among them, Fife, Nicholsen, and Mylne from Britain, J. Loeff from Holland and Pallavicino from Italy. Compared to the 2nd International R-rule girth measurement 1/4G and girth difference 2d are deleted, and the divisor altered from 2.5 to 2.35 to include all existing yachts. The meeting agreed on a suggestion by Fife to restrict height of sail plan to (2xR+1) above deck, i.e. 17m for an Eight Metre. Discussion took place on the Americans request for restriction on max height of freeboard. Agreement was made, and in the R1928 Amendment max freeboard in formula “F” is (0.08xR+0.25), which for an Eight Metre is 0.89m. Centreboard was a matter of greater disagreement. This was mainly a concern related to America. The meeting concluded that centreboards in principle could be accepted subject to agreement on a limited max depth. This to be future agreed as stated in the R1928 Amendment by a committee with American, British and Scandinavian delegates. However, as this was not concluded, I.Y.R.U. decided in meeting January 1931 that centreboards until further notice were not allowed on classes from 6mR and above. Max depth is in the R1928 Amendment 16% of L.W.L + 0.5 in meter. Rotating masts were forbidden. Hollow masts were allowed as demanded by the Americans. The reason for not allowing hollow masts in the past was cost. Hollow masts had become as cheap as solid mast. Thickness of hollow masts was agreed. New sails were not subject to measurement as long as sail plan remain unchanged. The Americans, Mallory, suggested cabin top on 8mR and 10mR Class as on Universal Rule Class “Q”. Britain, Burton and Dixon, preferred a clean deck and felt this could be solved by minimum height requirement under deck. Cabin roof on Eight Metres became a requirement. The Americans suggestion to delete “G” and “d” in Formula could not be dealt with before expiration. However, if the Americans decided to join the Classes as stated, I.Y.R.U. permanent committee would present to all members the proposal to delete “G” and “d” and to change the divisor. In the meantime the Americans could gain experience with the existing formula, for both parties to reach a mutual agreement later. Optionally the Americans could construct yachts according to their suggested revised formula. Sir Burton expressed that notice of termination would be given so that revision of the formula could take place at the expiration of the 3 years period, i.e. 1930. Mallory responded that the Americans returning home would file a recommendation for also joining the 12mR Class. On April 30th 1927 American and Canadian delegates met in Chicago where the final decision to accept the 6mR, 8mR and 10mR International Classes was made. American orders for the new classes were already made. An order for constructing fourteen yachts to the 10mR Class was entered into with Abeking & Rasmussen in Germany. They were all based upon the same drawing. Some Eight Metres were ordered, and five 6mR were reported under construction in addition to the thirty 6mR yachts already in America. 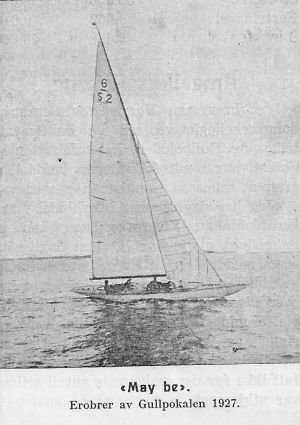 One 6mR for H. F. Whitton, who successfully raced 6mR “Lanai” at Hankö taking “The Gold Cup” to America and Seawanhaka Yacht Club. The 10mRs delivered from Germany proved during 1927 to be a success. A further decision to construct at least 6 Eight Metres based on the same drawing from Burgess, Rigg and Morgan was made, overall length 14.11m, L.W.L. 9.14m, max beam 2.67, seilarea 85.47sqm. In 1927 “The Seawanhaka International Challenge Cup” was moved back to the 6mR Class. The year before races had taken place in the Universal Rule “R” Class as no representative from Europe was foreseen to participate, thus favoring Canada as that years challenger. Norway files a challenge and is accepted. Races to take place in connection with the upcoming event for the “Scandinavian Gold Cup” in Long Island Sound in September 1927. The race for the "Seawanhaka Cup" commences on September 17th 1927 in Oyster Bay.The Norwegian challenger is 6mR “Noreg” raced by Magnus Konow, who had sailed 6mR “Oslo” in the 1925 team event. Defender representing America is Sherman Hoyt in 6mR “Clytie” designed by Clinton H. Crane. “Noreg” won 1st, 5th and 6th races, “Clytie” won 3rd and 4th races, 2nd race was cancelled, and “Noreg” took the Cup to Norway. Next years competition to take place in Norwegian waters and the Americans immediately filed a preliminary challenge for 1928. The 1927 races for “The Gold Cup” took place in Oyster Bay the days after the Seawanhaka Cup races, from September 24th to October 1st. Defender for America was 6mR “Lea”. Challengers were Britain with 6mR “English Rose”, The Netherlands with “De Ruyter”, Denmark with “Lilly”, Italy with “Mati”, Sweden with “May be”, Finland with “Merenneito” and Norway with “Noreg”. The Swedes were not happy with their performance in the 1925 team event and wanted strongly to prove otherwise. The 1st race was won by Finland, 2nd race by Sweden, 3rd race by Norway, 4th race by Sweden, 5th race by Finland, 6th race by Norway and the 7th race by Sweden who with 3 wins took "The Gold Cup" back to Scandinavia and Sweden. As with 6mR “Oslo” in 1925, 6mR “Noreg” was in fall 1927 sold in America. Discussion on change in element “S” sail area in rule Formula took place between the sailors as result of the Genoa jib. In meeting on November 1st 1927 KNS (Royal Norwegian Yachtclub) decides to forward this matter to SSF (Scandinavian Sailing Federation) for further consideration by I.Y.R.U. Ultimo 1927 Britain (Y.R.A.) files a notice for termination of the 2nd International R-rule for a possible revision of the Formula to take place in 1930. The matter of changes to the rule Formula element “G” and d” is highlighted by Seilas yachting magazine in Norway. Seilas sends a letter dated January 11th 1928 to yacht designers asking for their opinion on a possible deletion of “G” and “d”. - Charles Mac Iver, representativ for Britain in I.Y.R.U. - Clinton H. Crane, designer and delegate for America to the meeting with I.Y.R.U. One main concern was how the possible changes would influence on existing yachts. Experience proves that change in formula normally is in favour of new designs. Removing “G” and “d” would probably make faster yachts, although this could be compensated for in the division factor. However, do we take the risk that all existing yachts are out of date? I.Y.R.U. permanent committee issues a note in spring 1928 stating that putting the rule Formula on the agenda does not necessarily mean that changes have to be done. The Committee suggests the matter to be dealt with on the I.Y.R.U. Conference in fall 1929 instead of in fall 1930. (This was altered to the Conference in Oct. 1928). In the same note I.Y.R.U. Permanent Committee issues warnings for changes that may come related to the larger fore sails? Neither of these two proposals was agreed to by the I.Y.R.U conference in October 1928. No restriction was put on limiting size on fore sail. The 75% restriction on max height of fore sail was decided by I.Y.R.U. in Dec. 1932, and max width of Genoa jib restricted to 0.5xR aft mast on 5,6 and 8 metres in Sept. 1937 as decided upon by the Permanent committee in Nov. 1936. Change in rule Formula came about in Oct. 1933. 8mR yachts ready to go to America in spring 1928 at Anker & Jensen´s Yard in Vollen, Asker, Norway. In 1925 and 1926 Johan Anker had with success designed and constructed yachts to the American “Q” and “R” classes of which “Leonore” (Q Class), first owner Robert Amory in Boston, is for many yachtsmen known as “Cotton Blossom II” recently restored by Dennis Connor. Some orders for new International 8mR yachts were also placed in Norway. Challenger for America in the “Seawanhaka Cup” races 1928 is Clinton H. Crane with his own design 6mR “Akaba”. Defender for Norway is 6mR “Figaro 5”, designed by Johan Anker and raced by Claus Frimann-Dahl jr. First three wins are to become the overall winner. First race August 4th 1928 was cancelled due to lack of wind. “Akaba” wins 2nd, 3rd and 4th races and Clinton H. Crane who in 1928 served as President for Seawanhaka Corinthian Yacht Club, could take the Cup back home. In 1928 there are 10 contenders in “The Gold Cup” races, among them America. Races takes place in Sandhamn, Sweden and winner becomes Norway with 6mR “Figaro 5” raced by Claus Frimann-Dahl Jr.
America (USA) participated in all 3 classes in the 1928 Olympic sailing event in Antwerpen. The 8mR Class counted contenders from 8 nations. America was represented by B. Weston and 8US4 “Babe” owned by Owen Churchill, designed by Bridges and constructed by Abeking & Rasmussen in 1928. 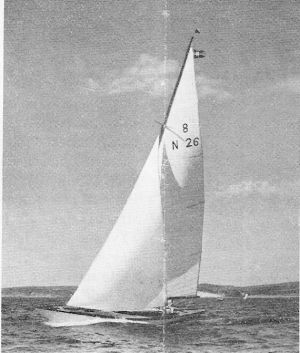 Norway was represented with 8N25 “Noreg II”, raced by Magnus Konow, design Johan Anker 1928. Winner in the 8mR Class become France with 8F1 “L’Aile VI”, owned by Mme V. Heriot, designed by P. Arbaut and constructed 1928. The 6mR Class counted 13 contenders. America (USA) was represented by H. F. Whitton in his own 6US31 “Frieda”, designed by Clinton H. Crane and constructed by H. Nevins in 1927. Winner of the 6mR Class was Norway represented by Crown Prince Olav in his 6N31 “Norna”, designed and constructed by Johan Anker 1928. There were 20 contenders in the Olympic Dinghy Class. Winner overall was Sweden represented by S.G.Thorell. America (USA) was represented by G.Kirby. At the meeting were representatives from Argentina (N. Clark Neil), Belgium (M. A. Grisar), Britain (R. T. Dixon), Denmark (Alfred Benzon), Finland (Ernst Krogius), France (Eug. Laverne and Ph. De Rotschild), Germany (P. Adriano, W. Rakenius and Erich Laisz), Italy (Paola Pallavicino and D’Albertis), Lettland (Alex J. Korst and Fr. Kette), Norway (Johan Anker), Spain (Enrique de Careaga, V. L. Doriga and Walter Meade), Sweden (R. von Heidenstam and Karl Ljungberg) andThe Netherlands (P. L. Lucassen and van Heemstra). North America Yacht Racing Union (N.A.Y.R.U.) was represented by Benjamin P. Weston and the Norwegian Johan Anker. Others were representatives from Lloyds (B. C. Laws and W. Mc. C.Meek), Det norske Veritas (J. Bruhn), Bureau Veritas (G. M. Milne), Germanischer Lloyd (D. S. Whiteford), and technical advisors W. Fife, C. E. Nicholson, A. Mylne, Morgan Giles, Loeff. Chairman: Sir William Burton, President of I.Y.R.U. Permanent Committee. In agreement with the Americans the matter of deleting “G” and “d” from Formula was on the agenda. Most speakers argued for keeping the Formula as is, Benzon, von Heidenstam, Dixon, Nicholson. Anker wanted a change himself, but Norway as member of SSF wanted otherwise. As representative for N.A.Y.R.U. Anker suggested the matter to be further discussed together with the proposal for change in min displacement. The meeting concluded with not changing the Formula. On behalf of N.A.Y.R.U. Anker presented a proposal for a new 14 ½ mR Class based upon the formula and restrictions earlier agreed for yachts above 12mR, i.e. (L+sqrtS-F)/2.3. The 14 ½ mR Class would be comparable to the Universal Rule “M” Class and the old 1st Rule 15mR Class. Agreement was made for Britain and America to sort out the details. In I.Y.R.U. meeting in Oct. 1929 the decision on the 14 ½ mR formula was changed to be the same as for classes 12mR and below. Max height of sail plan for 14 ½ mR to be 29 meters above deck. As to the submitted warning from I.Y.R.U. Permanent Committee of May 1928 on penalty on large fore sail (the Genoa jib), the 1928 conference decided; No penalty on large fore sails to take place. The Genoa jib had become popular also for cruising. When wind picked up the large fore sails caused problems for many crews on a wet front deck, which resulted in the demand for larger hulls with more displacement. With larger hulls the Genoa could be used in stronger winds. Such the decision not to include penalty on fore sails was in disadvantage for the older yachts. The increased driving force, and larger displacement of new yachts, introduced more forces on rig and masts, causing many mast failures. As such scantlings for mast became a matter for discussion. The Americans opposed restrictions on mast as this was a matter of consideration for the designer. In Europe many sailors felt different, as this also was a matter of safety. A committee was established to look into scantlings for masts, chaired by Sir Burton with members von Heidenstam, Anker and Dixon. However, for the older yachts with less displacement the situation with the larger fore sail was reverse. When wind picked up, sail area had to be reduced earlier than before. Other matter discussed in Oct. 1919 related to the R-rule where measurement in fresh water. The meeting agreed that measurement for an Eight Metre in fresh water was not to exceed R=8.04, and for a Six Metre R=6.03. Measurement Certificate for salt water is also valid for fresh water condition. If floating marks are submerged in fresh water, control measurement could be requested by any competitor for checking that fresh water measurement did not exceed R=8.04 for an Eight Metre. The meeting decided to add Germany on to I.Y.R.U. Permanent Committee. The Royal Northern & Clyde Yacht Club remains an active participant in the competition for “The Seawanhaka Cup” and files a callenge for the 1929 races to take place in the 8mR Class. Selected defender for Seawanhaka Yacht Club is after trial races 8mR “Gypsy” owned by Frank C. Paine and constructed at G. Lawley & Son. Challenger representing Scotland is 8mR “Caryl” constructed by Fife and raced by her owner W.F. Robertson. Races takes place at Oyster bay in Long island Sound on September 7th. After 4 races the competitors had 2 wins each. The last race takes place on September 13th. “Carol” beats “Gypsy” with ½ boat length on the 20mile course and Scotland wins the Cup. No race takes place for the Seawanhaka Cup in 1930. The Americans files a challenge for 1931. Challenger is 8mR “Priscilla 3” designed by Clinton H. Crane and constructed by H. B. Nevis in New York 1929. Owner is Johnsten de Forest who represented Norway in the 1925 Scandinavian – American 6mR races in Long Island Sound. Defender for Scotland was selected 8mR “Saskia” designed and constructed by Fife. “Saskia” with her owner Mr. Young won four races in a row on the Clyde in mainly rough weather. In 1932, the competition was back in Six Metre yachts. The British defender was 6mR “Maida” raced by her designer John G. Stephen. Challenger from America was 6mR “Jill” designed by Olin J. Stephens who crewed onboard with the owner J. Seward Johnson at the helm. Winner after 3 races was “Jill” representing Seawanhaka Corinthian Yacht Club. Sweden takes "The Gold Cup" back in 1929 and defends it in 1930. The Americans are among the challengers in 1930 and 1931. In 1931 the Cup returns to Norway who also is the winner in 1932. The Olympic regatta in Los Angeles 1932 suffered from the depression. Only two contenders in the 8mR Class, USA and Canada, winner was USA. Three contenders in the 6mR Class, Sweden, USA and Canada, winner was Sweden with 6mR “Bissbi”. No participation from Norway in the International R-rule Classes. USA won the two men Starboat Class, and France the one man Dinghy Class. Revised scantlings are decided upon for wooden hollow masts. For an Eight Metre the diameter of hollow mast halfway up from deck to forestay, is 180mm. Diameter to be reduced with 5% at deck level, 20% at forestay and 50% at top. Wall thickness equal 1/5 of diameter. Diameter of solid masts may be reduced by 8%. Hollow masts are to be solid to 0.3 m above deck. This was in 1933 changed allowing halyards to pass inside down below deck subject to removed material added on the outside. No restriction on minimum weight on masts was decided in 1929. The pending matter on centreboards was further postponed as no proposal was presented by the Americans. A proposal from France for a new 5mR Class was unanimous agreed with restrictions not included herein. The Formula does not contain either “G” or “d”. However as “G” is deleted, beam “B” is included with a negative factor. Thus promoting wider yachts. Min displacement is 1500 kg. SSF (Scandinavian Sailing Federation) meeting on November 7th 1931. Matters dealt with in relation to the R-rule were Karl J. Ljungbergs, Sweden, proposal on metal masts. Further the Permanent Committees suggestion on restricting height of fore sail to 75% of max heigt of sail plan which had been withdrawn. Benzon, Denmark stated that with the overlapping jib there was good reason to include 100% of fore triangel in element “ S” in Formula instead of only 85%. The Americans had forwarded a suggestion of WC in Eight Metres. Change in measuring bow girth on the new Scandinavian 7 metre Class was agreed. Agreement was made on Sweden, Karl Ljungbergs proposal on steel masts. Min weight of steel masts decided were; 6mR - 63.5kg, 8mR – 145.1kg, 12mR – 453.4kg. Centre of gravity not to be lower than 0.37 later changed to 0.38 times mast height above deck. Diameter on steel mast to be the same as on wooden mast. No restriction on min wall thickness. As to wooden masts no changes should apply for the existing masts, however, new wooden masts have to comply with the same minimum weight restriction as set for steel masts i.e. 145.1 kg for an Eight Metre. The proposed restriction on height of foresail was agreed. Max height of forestay is 75% of max height of sail plan, which for an Eight Metre is 75% of 17m equal to 12.75m above deck (as per today). Shall not apply to yachts existing masts. Restriction was set on Genoa sheet for 10mR and above, which was not to extend 0.4xR aft mast. (0.5xR for 5mR, 6mR and 8mR Class decided by I.Y.R.U permanent committee meeting in Nov. 1936 and approved by I.Y.R.U. meeting Sept. 22 1937). Representatives to the upcoming I.Y.R.U. meeting in London were given recommendation on change in Formula; Delete “G” and “d” in formula, revise restriction on min displacement to (0.2xL.W.L+0.10) cubic. Bow girth difference factor in L to be altered to 1 instead of 1,5. Min beam restriction at L.W.L. proposal 0.22 (L+0.4) metres. Heidenstam from Sweden wanted a change in formula also to be reflected in reduced min displacement, especially for 6 metres. He felt KNS proposal of approx 10% reduction in min displacement was to small and was looking for a 25% reduction. Halfdan Hansen, KNS, responded that yachtsmen in Norway were looking for better Cruisers and constructed yachts outside the R-rule. Stenbäck from Finland stated the problem was not the displacement, but designers reduction in beam. a) “G” and “d” should preferably be removed from formula. b) Measurement of Bow girth difference to be in accordance with Ljungbergs proposal, limited to a height 4% of R above L.
c) A restriction for controlling min beam. Eliminate “G”, no changes in elements “d”, “S” and “F”. Divisor changed from 2.5 to 2.37. Bow girth difference in L to be measured to a height of 5% of R above L in accordance with Ljungbergs proposal (4%), allowing wider beam in bow at deck level. Min bow girth difference not less than 30% of vertical height. The 3rd Rule was agreed upon for a 6 years period from Oct. 1st 1933 to Oct 1st 1939. The 2nd Rule would be running in parallel expiring Jan 1st 1937. Yachts commissioned to the 2nd Rule could compete on equal terms with 3rd Rule yachts. In Norway the opinion was that the new rule was not the answer to more cruiser friendly yachts. As no restriction had been agreed on min beam “B”, beam would rather be narrower than wider, although the beam on front deck would increase. As designers got familiar with the new rule, displacement and keel ballast would likely increase together with the more narrow yachts in order to get faster yachts. One main argument against making to large changes was “vested interest” in the existing yachts. As before it would prove that any change was in benefit of new designs. However, 2nd Rule yachts could measure in to the 3rd rule Class becoming 3rd Rule yachts, complying with 3rd Rule restrictions. For some this would give an increase in sail area of 1,5 –2 square metres in element “S” in formula, which also proves the potential benefit for new designs. Time would show how the deletion of “G” in formula without including any restriction on min “B” would affect the development. 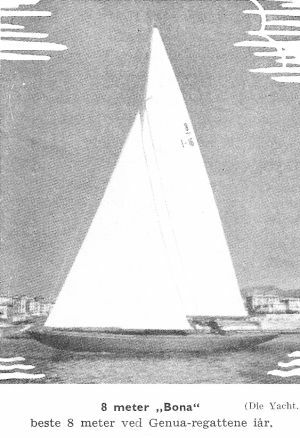 8N23 “Irene VI” won the second Kattegatt Cup Trophy to Norway in 1928. KNS presented a new everlasting cup, which to day is the “Sira” Cup. Challenger in 1930 was G.K.S.S. with 8mR “Cagg” who won the first race. The Norwegian defender and winner was Johan Ankers design of the year, 8N26 “Silja” raced by Ditlev-Simonsen. In 1934 and 1935 “Silja” was again the defender and challenger both years Sweden 8mR “Lizzie 5”. Germany called in 1935 for a Measurement Conference to take place during the Kiel regatta to ensure equal understanding of measurements before the upcoming Olympic event in 1936. Matters of difference were presented to I.Y.R.U. for clarification. Several 2nd Rule yachts were certified to the 3rd Rule. In 1936 Sweden challenger for the Kattegatt Cup was 8mR “Yvonne”. Defender for Norway was thought to be Johan Ankers new 3rd Rule design 8N31 “Viking”, however, “Silja” proved to be superior to “Viking” and was once again selected defender for Norway. For the fourth time “Silja” won the Kattegatt Cup to Norway and proved her excellence as one of Johan Ankers best Eight Metre designs ever. “Silja” was also selected to represent Norway in the Olympic 8mR Class races in Kiel 1936. Ten nations participated; Argentina with 8mR “Matrero 2” (ex Vaterland), Britain “Saskia”, Denmark “Anitra”, Finnland “Cheerio”, France “Ea 2”, Germany “Germania 3”, Italy “Italy”, Norway “Silja”, Sweden “Ilderim” and USA “Angelita”. The results after last race was Italy Gold medal with 55 points, Germany and Norway both 53 points. Norway with “Silja” won Silver medal after rematch, and Germay with “Germania 3” got the Bronze medal. G.K.S.S. filed in 1937 a new challenge for the Kattegatt Cup. Defender for Norway became as last years “Silja”. Swedens challenger was again “Yvonne” who this time managed to take the Cup to Sweden. Norway files a challenge for races to take place in Gothenburg 1938. Both in Sweden and Norway new Eight Metres are constructed for the upcoming event. Defender for Sweden becomes Tore Holms new design 8S19 “Albatross“ raced by Georg Lindahl. 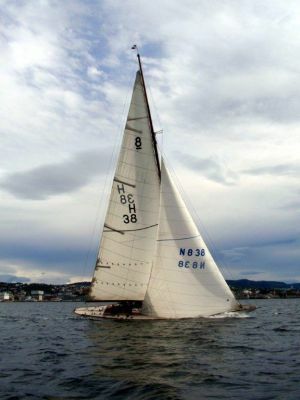 Challenger for Norway is 8N33 “Sira” raced by the designer Johan Anker himself, who was selected challenger for Norway after trial races against 8N32 “Anne Sophie” designed by Bjarne Aas. Johan Anker with “Sira” wins the Kattegat Cup back to Norway. In 1939 “Sira” with Anker and “Albatross” with Lindahl meets again at Hankö. As last year in Gothenburg, Anker and “Sira” wins the Cup for Norway. Matters of great discussion leading up to I.Y.R.U. Permanent Committee meeting in 1936 were again related to the overlapping jib, “the Genoa”. SSF meeting in Oslo on November 13th 1936 filed a recommendation that the extension of “Genoa” aft mast in the 6mR and 8mR classes should be limited to 0.4 x R as previous agreed for the 10mR and 12mR classes. A further restriction on max height of boom above deck was recommended. With large overlapping jib the area under the boom would with higher booms, increase sail area without an increase in element “S” in formula. Decision made by I.Y.R.U. Permanent Committee in London on November 26th 1936 limited boom height on 6mR Class to max 1.10 metre above deck, and max 1.25 metre for 8mR Class. As to the “Genoa”, decision was made that the jib sheet block in deck on 6mR should be max 3 metre aft mast, and max 4 metre aft mast on 8mR (revised in 1937). Loose footed mainsail was thought to be unpractical in strong winds and would as such result in two main sails which for economical reasons was prohibited. 8mR “Bona”, owner Rosasco, Italy. Coppa d’Italia 1937; “Bona” beat “Germania 3”, “Ilderim” and “France”. The Permanent Committees decision on limiting “Genoa” sheets on 6mR and 8mR was rejected by France who called for an international I.Y.R.U. conference on the matter. Conference was agreed to take place in London on September 22nd 1937 and Permanent Committee to meet two days earlier on September 20th for preparation. Again the question of measuring element “S”, sail area, in formula might be raised. This time by the British, who might suggest the fore triangle to be included 100% in “S” instead of the present (since 1919) 85%. Scandinavian Sailing federation (SSF) met on September 11th 1937 to discuss these and other matters. Subject to the international formula, min beam “B” was a major concern. Wider and more seaworthy and cruising friendly yachts was wanted. An alternative to the R-classes was to have separate classes for offshore cruiser racing if not getting attention within the international sailing community. Revised decision on length of “Genoa” aft mast, max 0.5 x R for classes 5mR, 6mR and 8mR. The British suggestion of including 100% of fore triangle in element “S” in formula instead of 85% was postponed. Restrictions on min beam on R-yachts were agreed; 6mR (6 feet = 1.83metre), 8mR (8 feet = 2.44metre), 10mR (9.9 feet = 3.02metre), 12mR (11.8 feet = 3.6metre), to be measured at 1/3 of freeboard above floating waterline. The restriction was made applicable for yachts laid down after September 1937. Height of boom above deck to correspond with decisions made by Permanent Committee year before put in force for measurement Certificates after November 26th 1936. All new mainsails after Nov 26th 1936 to be measured along boom, not perpendicular to mast. Subject to SSF inquiry about Cruiser Racing (CR) the meeting decided to forward this matter to the Permanent Committee for further consideration. 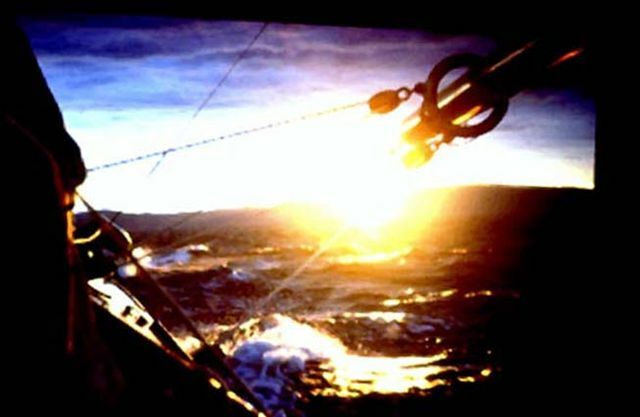 “Seilas” yachting magazine in Norway commented that the international response to Scandinavians request for wider yachts resulted in restriction on min beam less than any Eight Metre yacht constructed under the 3rd Rule. The result can not be understood in any other way than I.Y.R.U. does not want wider yachts. This attitude will end construction of larger yachts Eight Metre and above under the International R-formula. In 1937 only three 8mR, and two 12mR, are constructed in Europe, and no 10mR. In 1938 one 12 metre CR and four 10metre CR were constructed in Norway designed by Chr. Jensen (go to section Summary). In Scandinavia, Sweden had again filed a challenge for the “Kattegatt Cup”. Crown Prince Olav’s Eight Metre 8N33 “Sira” designed by Johan Anker had won the last race in 1939. Johan Anker had a new design, what he thought to be a faster down wind performer on the drawing board, “8mR Project 1940”. In April 1940 wartime came about in Norway and Johan Ankers “8mR Project 1940” stayed on the drawing board for more than 40 years until the interest for Eight Metre racing, and the foundation of International Eight Metre Association (IEMA) created a renaissance for the proud yachts. Johan Anker passed away on Oct. 2nd 1940 nearly seventy years of age. With him an era within Norwegian and Scandinavian yachting ended. The “Three Musketeers” Alfred Benzon, Johan Anker and Karl Ljungberg had played an important role in the development of the international sailing since before the come about of the 1st International Rule in 1906. Their sole mate and companion Gustav A. Estlander had passed away in 1930. Of the four, Karl Ljungberg was in 1940 left with others to continue their work. Bjarne Aas was still going strong after the war. Herman Linge with his international reputed designs “Soling” and “Yngling” proved the continuity of Norwegian and Scandinavian yacht design skills, and Swedish Peter Norlin, Pelle Petterson and others. Crown Prince Olav was for many years member of I.Y.R.U’s permanent committee also after he became King of Norway. To the upcoming 8mR World Cup event at Hankö in 1983 he gracefully presented the Kattegatt Cup to IEMA as a trophy for yachts laid down before 1965, today known as the “Sira Cup”. Chronological list of 8mR yachts first commissioned and launched to the 2nd & 3rd International R-rule given sail racing no in Norway 1920 – 1940. Amendments to the R(1919) rule made in force for the particular yacht noted as R(1921), R(1928) .